Le Close Sainte Marie. French Farmhouse Gites. Web design by Bazil. Le Close Sainte Marie Gites boasts four charming traditional French farmhouse and barn conversion gites available as holiday lets in the village of Cenne-Monesties within the Department of Aude in the Languedoc region of Southern France. All self catering units at Le Close Sainte Marie are fully equipped to ensure you have have the perfect stay in this wonderful region of France. The estate has extensive grounds to explore containing an orchard, several meadows and the beautiful River Lampy. 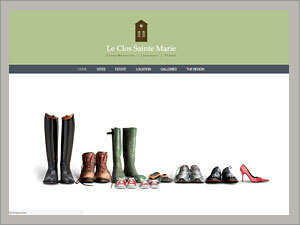 Responsive website designed, and maintained by Web Design by Bazil.